The location was perfect, nestled in a private cliff side with fantastic waterviews. Watching the sunset from out private hot tub was the icing on the cake. Staying in a cave should be on everyone’s must-do list! Denis, who took toted our bags and maintained our balcony and pool area was outstanding. Endless energy and always with a smile. We really loved our stay here. We stayed in the aegean magic villa, which has an indoor jacuzzi pool and a hot tub on the roof as a special treat for our anniversary. Anastasia met us near the villa and brought us there, and she was so friendly and nice. Communication with the staff prior to our arrival was great with prompt replies. The room itself was very comfortable and large. Amazing view and super large terrasse ; 2 large bedrooms & bathrooms ; everything in line with property description. Communication with owner has been excellent. Took care of car booking ; recommended and booked restaurants. Breakfast included and delivered to the villa every morning. It was the perfect stay in every way. The staff is so friendly and lovely. Tenia the manager is amazing at her job and Denis who helped us with anything we needed and brought out breakfast so friendly. The suite is gorgeous, can’t get better than this :) we are very grateful. The view was outstanding, and the private veranda with hot tub was fantastic. The view is to die for. The property is exceptionally clean. Dennis kept the pool sparkling clean and always had a smile and warm greeting for us. He is awesome. Tenia was kind, helpful, and a pleasure to interact with. My wife and I enjoyed every aspect of the stay at White Pearl Villas. We will definitely stay again and highly recommend the property to others. We liked almost everything about this property. The villa was exactly what we expected it to be - it was clean, comfy and had a great view. What did it for us was the service. They were very responsive and accommodate our every need. Lock in a great price for White Pearl Villas – rated 9.4 by recent guests! One of our best sellers in Oia! Carved into the volcanic rocks of Oia, White Pearl Villas offer individual accommodations with breathtaking views over the Caldera, the Aegean Sea and the Volcano. 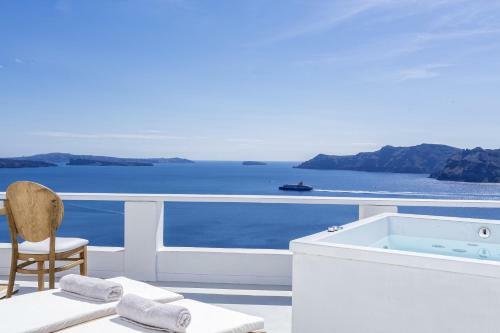 Featuring modern-Cycladic décor, each villa features a private pool or a private indoor/outdoor hot tub. All tastefully decorated villas include an espresso coffee machine and complimentary coffee and tea supplies. Fitted with built-in beds and sofas, they come with a flat-screen TV, free WiFi and air conditioning. Free toiletries, slippers, as well as linen and towels are provided. Guests can start their day with a la carte breakfast including Greek, American, vegan and organic options. 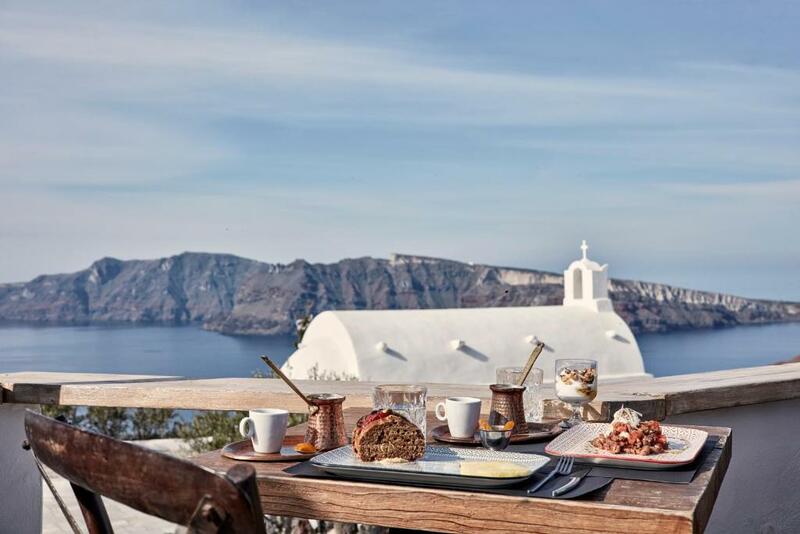 White Pearl is within a short walk from restaurants, café bars and a stone's throw away from the famous sunset meeting point, the Venetian Castle of Oia. 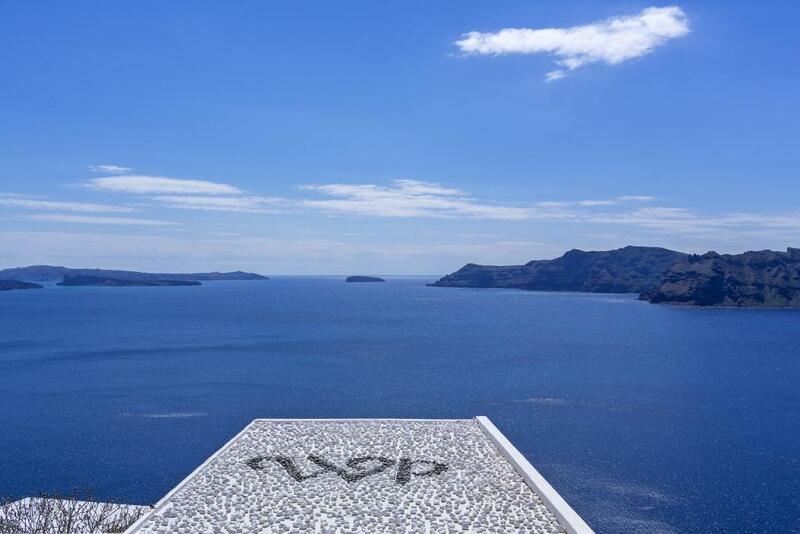 It lies 11 mi from Athinios Port and 9.9 mi from Santorini International Airport. The town of Fira is 6.2 mi away. When would you like to stay at White Pearl Villas? 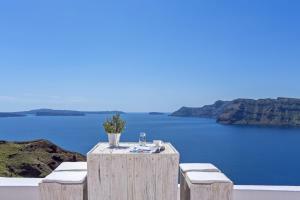 This villa is located at the end of the village of Oia. 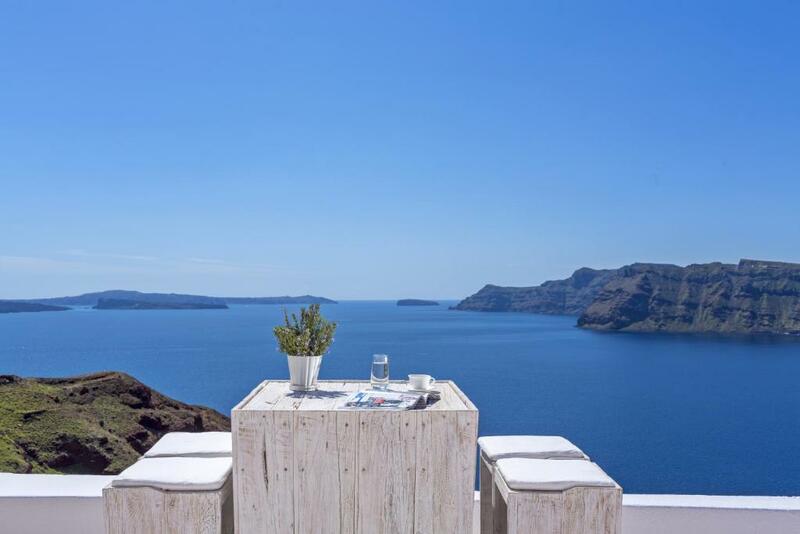 -restricted Aegean Sea views from the outdoor seating area. -built-in king-size bed, anatomic mattresses and high-quality bed linens. -access to a shared swimming pool. Vanessa with her sister Katerina will be your hostesses during your stay in Santorini. Their main goal is to offer luxury accommodation and personalized hosting to ensure that you have a memorable holiday experience! House Rules White Pearl Villas takes special requests – add in the next step! White Pearl Villas accepts these cards and reserves the right to temporarily hold an amount prior to arrival. Please inform White Pearl Villas of your expected arrival time in advance. You can use the Special Requests box when booking, or contact the property directly using the contact details in your confirmation. perfect location. the host very nice to help us reserve the restaurant and next day’s taxi to airport. We will come back again. Staff are very friendly & helpful. Thanks Tenia and Denise. good location and perfect services. 1. Had to avoid donkey poo or dog poo on the path down the steps to the villa as this was not cleaned up but left there to fester. 😬 2. When it rained heavily, there was nothing to do. The tv programs were limited. And no other activities possible. The boats will not go to the volcano. 1. Breakfast choices was excellent and could be served to your villa. 2. The hosts were always ready to help 3. It was walking distance to the shops, restaurants, sunset view in Oia. 4. There was a public bus stop for the buses to Fira. Imerovigli n back. 5. The place was not as touristy as Fira. 6. Umbrellas were provided during the rain. 7. It was not that crowded as the summer season had not started. 8. We received a complimentary bottle of Santorini wine to enjoy as well. Amazing host. Tenia was so friendly, helpful and organised. Couldn't have asked for better. Firstly, I would like to emphasise how fantastic the staff were! Visited Santorini to celebrate my girlfriend’s 21st, they made an amazing effort to ensure we’d have a trip to remember. Incredibly friendly, couldn’t do enough for us and made personal touches to make our trip unforgettable. The villa was truly stunning inside and out. We were pleasantly surprised at how spacious the facilities (particularly the bathroom and inside plunge pool) were. Our favourite highlight of the villa was the breathtaking views from our private outdoor hot tub, which we thought were one of the best views on the island. I’d like to thank the staff again for an amazing trip and we’ll definitely return in the future. Amazing location, very clean villa, even better than the photos and the Hosts so warm and kind, like you already knew them, willing to help on any request. The breakfast was excellent, many choices, we were able to have it on the day of arrival before the check in because the day of check out we were leaving the place before dawn. There was a surprise waiting us for the day of our departure with a basket for an extra breakfast!! they will promote doing the private boat tour. Dont do it its not worth the money. Staff members are so friendly, approachable and helpful! Clean rooms and great location in Oia. Amazing hotel! More than imagine. I loved everything, including the free breakfast each morning! we can not eat breakfast at hotel. if we want to eat the breakfast in Hotel, we have to pay 10 euros. great location and kind staff, but high price, low quality.